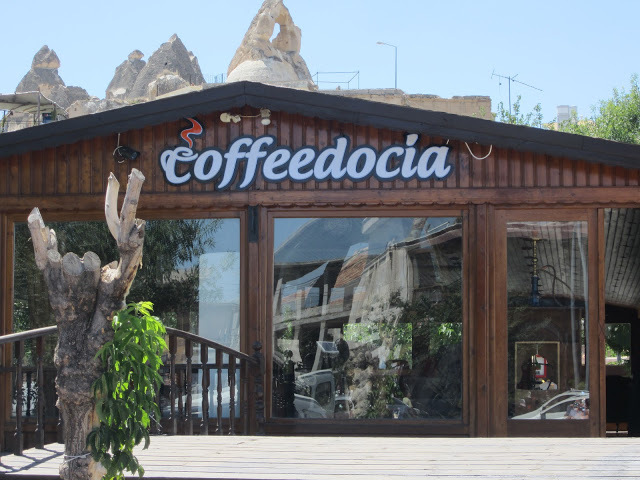 CAPPADOCIA!!!! What an incredible place!! So incredible, I’m going to make this a 2 part post, to make sure to cover everything!! 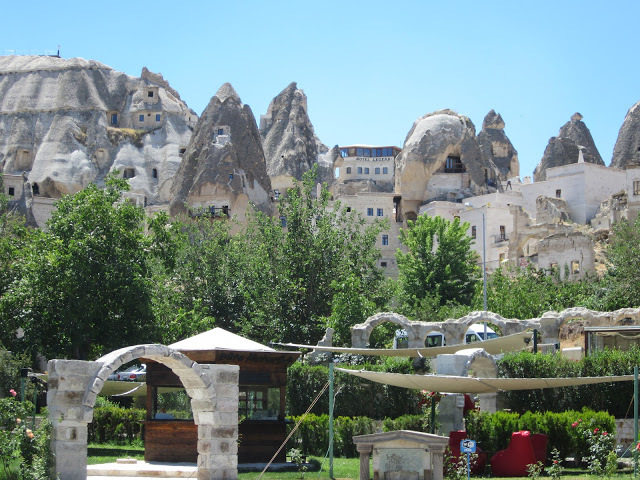 Not bad for an ancient region of Anatolia where I only visited one town (Göreme)! 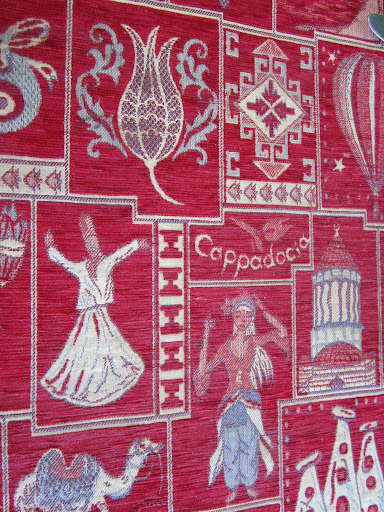 To start with, Cappadocia has a magical feel to it. 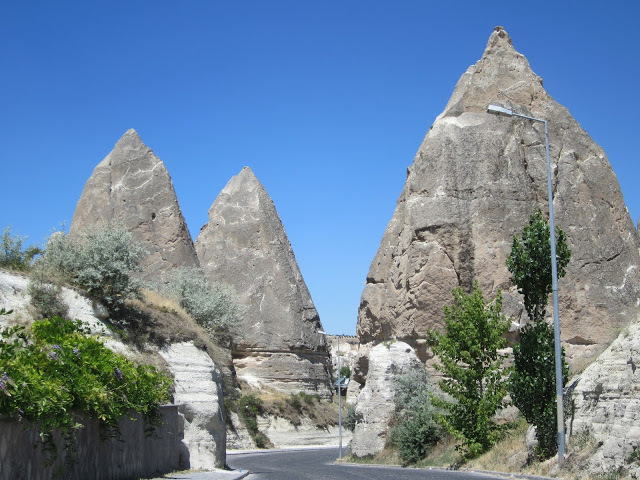 Just with the fairy chimneys alone, the place has a surreal air about it, kind of making you feel like you’re on another planet. Some parts have a distinctly other-worldly feel about them, calling to mind images of the moon’s surface. Tell me this doesn’t have a bit of a Lunar feel to it?? 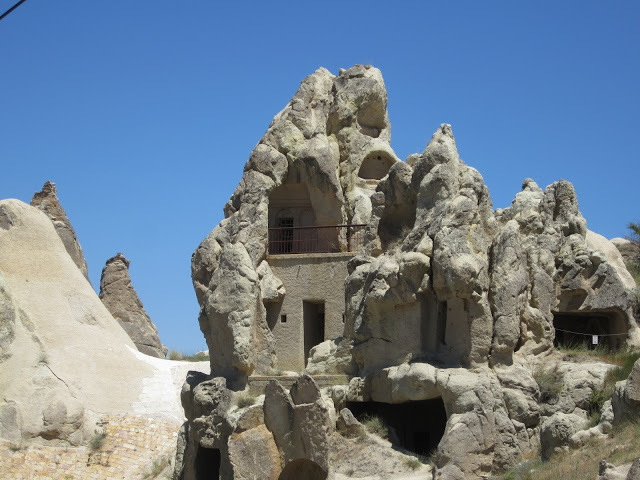 I was responsible for booking our hotels for this trip, and I settled on the Kelebek Special Cave Hotel for Cappadocia – a decision I remain thrilled with, as I loved that hotel!! 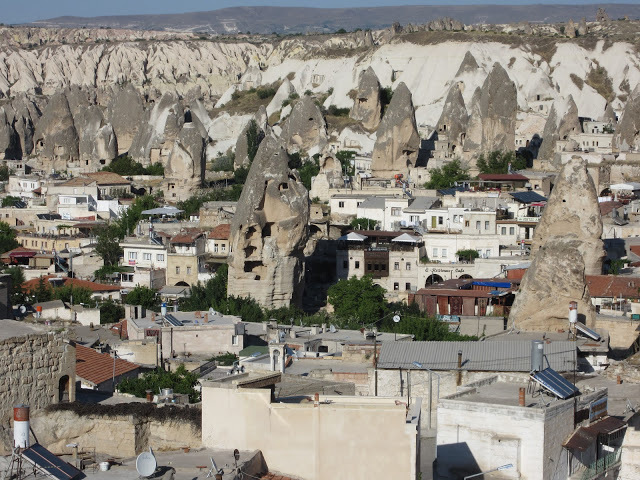 The hotel had a great view of the landscape, and was well located to visit the town on foot, and close enough to walk to the Göreme Open Air Museum. Though if you’re walking there in summer, bring water and walk slowly!! It gets H-O-T, hot!!! Hydration is key on trips like this, so a water bottle came with me at all times during this visit! 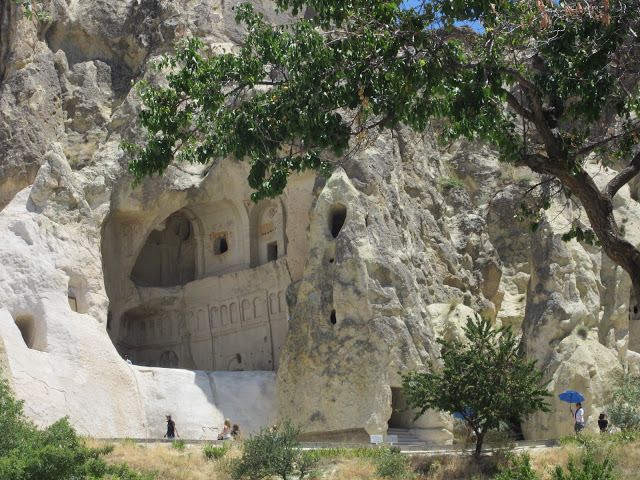 Now, one of the special things there is to do here is to visit the Göreme Open Air Museum, which is a UNESCO World Heritage Site. UNESCO stands for the United Nations Education, Scientific and Cultural Organization, and their Heritage Site list is seen by many as a “must-see” guide to world travels. A and I grabbed our water bottles and made our way to the open air museum, probably picking one of the worst times of day to go, but since we were only here a short time, we didn’t have much choice of times. We wound up there around lunch time, and stopped along the way back for food and hydration as the morning sun had drained us of much of our energy. If you’re going in summer, and plan to walk to the museum, either go first thing in the morning, or late in the day, so as to miss the mid-day heat!! Luckily, though, it’s a dry heat – and that really does make a difference! The lack of humidity made it not so bad, so even if the only time you can go is mid-day, I say do it! 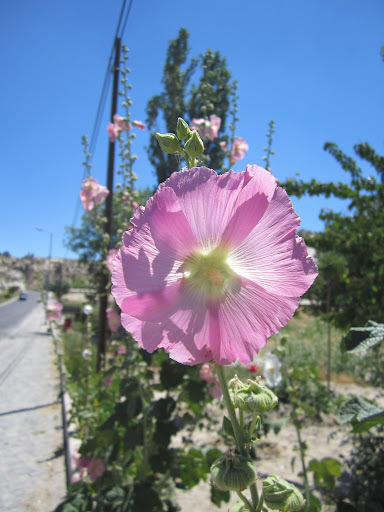 The walk from the Kelebek Hotel through town to the entrance of the museum was not too long, though it felt a bit long in the heat!! We passed by some beautiful spots, and some nice local businesses, looking to profit off of the tourist industry in the area. There were so many cute places that we didn’t get to stop in to that I definitely want to go back and see more of this town in the future!! 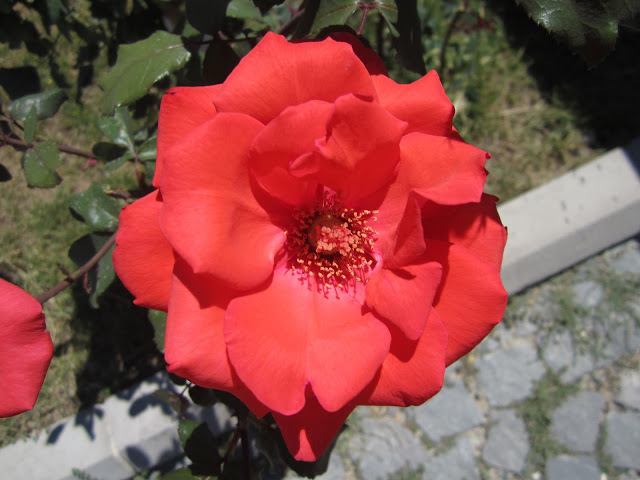 We passed some beautiful gardens along the way, and a horse farm, so the walk was actually quite lovely. The beautiful carved faces of some of the buildings must have taken a long time to make! This is the entrance to the Dark Church. 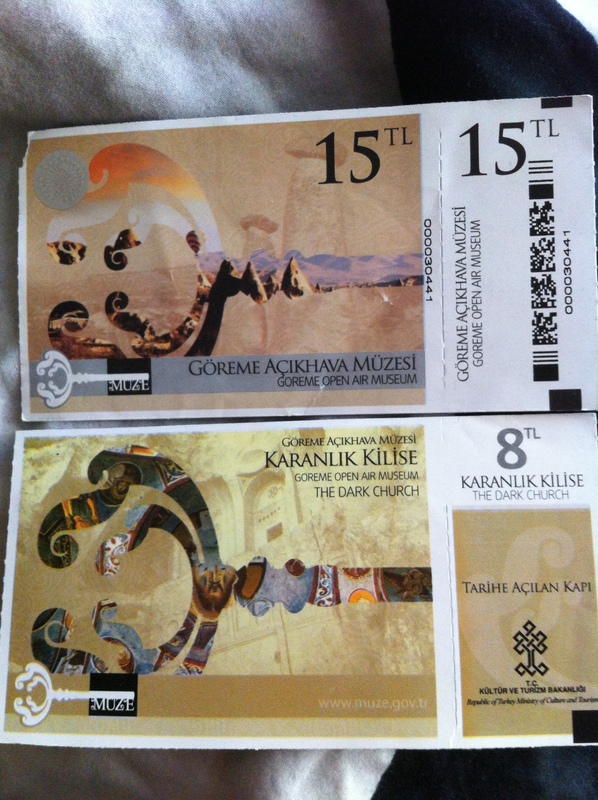 When we arrived at the Open-Air Museum, we got our tickets, and walked in. It was a bit busy, but not unbearably crowded, and we walked in and out of a lot of the buildings that were carved out here. 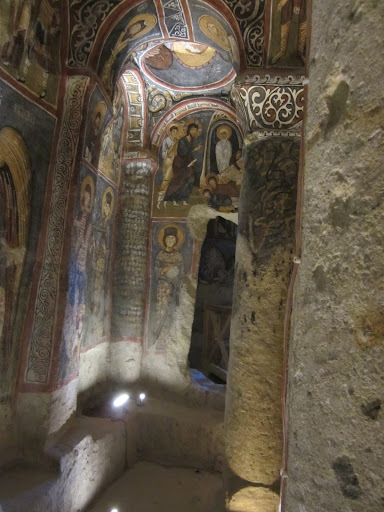 Many of the buildings in the museum had religious significance, as this area was settled during the Roman period, and Christianity was the prevailing religion in this area. 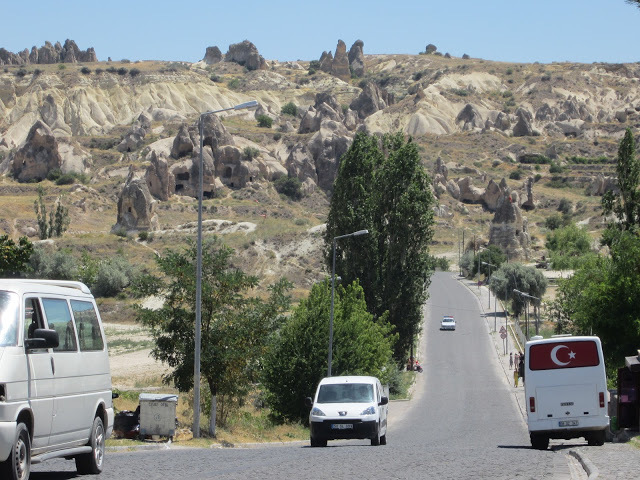 There are many churches in this region, carved out of the rock structures. 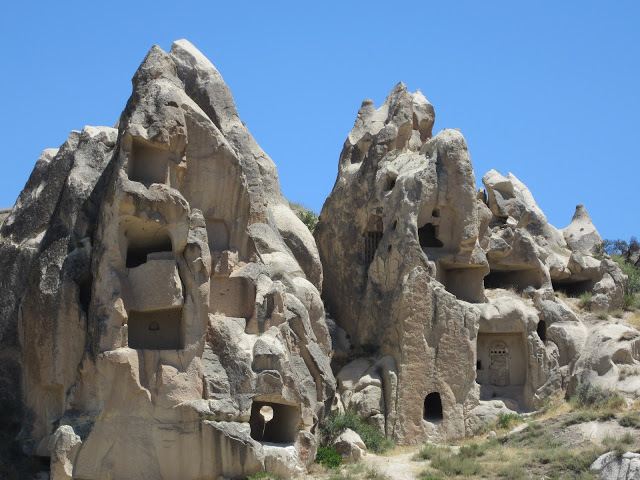 This makes the combination of man-made structures and naturally occurring formations incredible to behold! 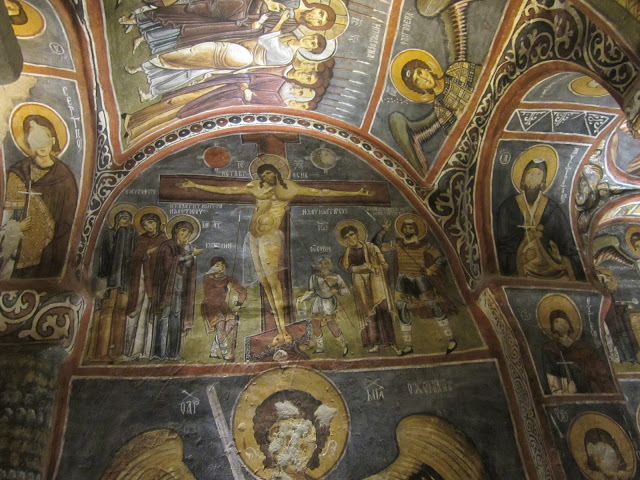 There were many small chapels and larger churches. 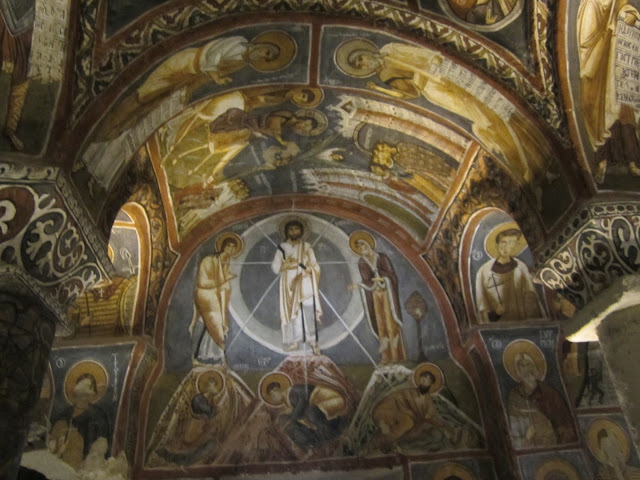 There was a separate entry fee for the Dark Church, and I have to admit, that put me off for a moment, and I considered passing it up out of principal – it seems like it should be included in the entry cost to the Open-Air Museum! But we decided to go in, as it wasn’t expensive, and I’m very glad I didn’t pass it over out of stubbornness! 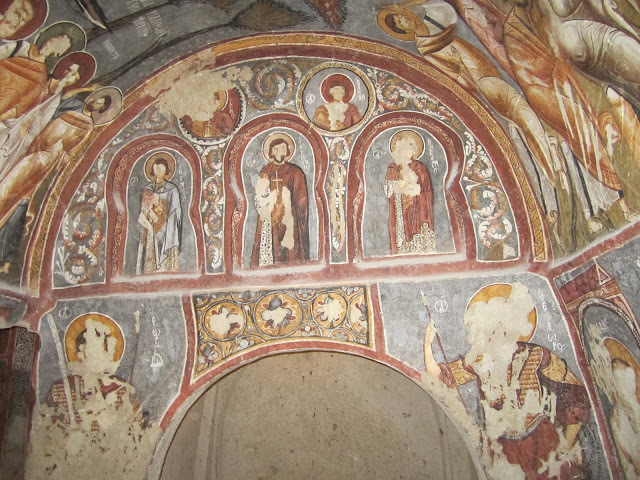 Filled with 11th Century frescoes, the Dark Church was something to behold! Here are some photos of some of them. 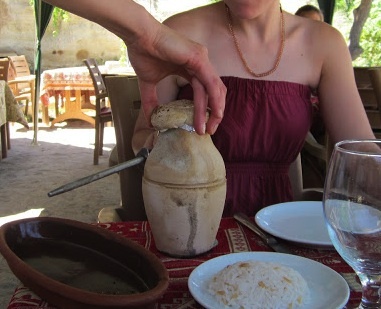 A trying to open the clay pot – she succeeded in opening it, but it went poorly and went all over the place! After the Dark Church and a few other buildings, we went to the Gift Shop to take advantage of the air conditioning for a little while and use the restrooms to recharge for the walk back to town & uphill back to our hotel. 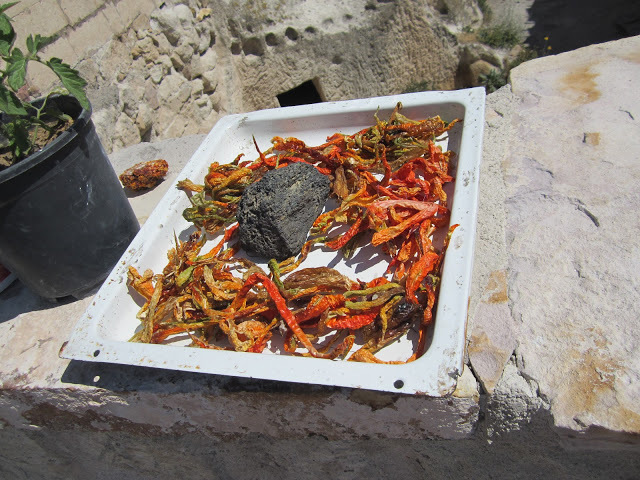 We decided to stop along the way back and have some lunch at a little place along the road back into town, and A decided to try a meal prepared in a manner typical in this region: inside a clay pot that you have to actually break to get at your food inside. Unfortunately for A, it didn’t entirely work out right the first time, and she wound up wearing some of the steaming hot beans that were inside it….. The video below is how it’s supposed to be done! 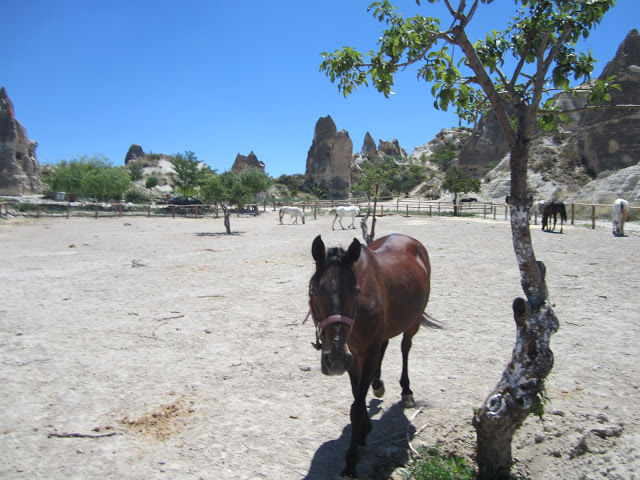 That’s the waiter at the Dibek Restaurant & Cafe in Göreme. Actually, our meal at the Dibek Restaurant & Cafe warrants discussion. We had made friends with two Americans who were also staying at our hotel, and the four of us had decided to go to dinner together. We had a couple of glasses of wine, and we were having a good time, and I suppose laughing and talking a bit loudly, and found ourselves being shushed by a neighboring table where a Belgian couple was sitting. Yup, we had become the table of “obnoxious Americans”. Not wanting to be thought of that way, at A’s suggestion, we sent an apology bottle of wine to their table, and they wound up sharing it with us, and the corner table in between us (if memory serves, the corner table people were American and Canadian) also joined the conversation, and the next thing you know, our whole section of the restaurant was hanging out and having a grand old time. It was a great night! I’ve said it before, and I’ll say it again: I love the random friendships that you can strike up while travelling! Our new Belgian friends were taking a motorcycle trip around Europe, and would be leaving in the morning for their next stop. We had a great chat with them, and a fun night was had by all! In fact, we wound up staying out later than we had intended, in light of the fact that the next morning we were being picked up at 4am ,or some other similarly ungodly early hour, to go on a sunrise hot air balloon ride, which will be the subject of my next post. But it was totally worth it to have such fond memories!! Alright, this post has gotten long enough!! 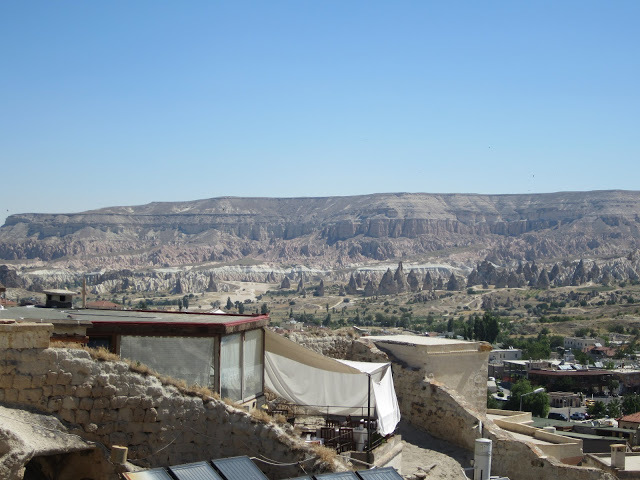 I’ll be back with more from Cappadocia, including our Sunrise Balloon Tour soon though! Hydration!! 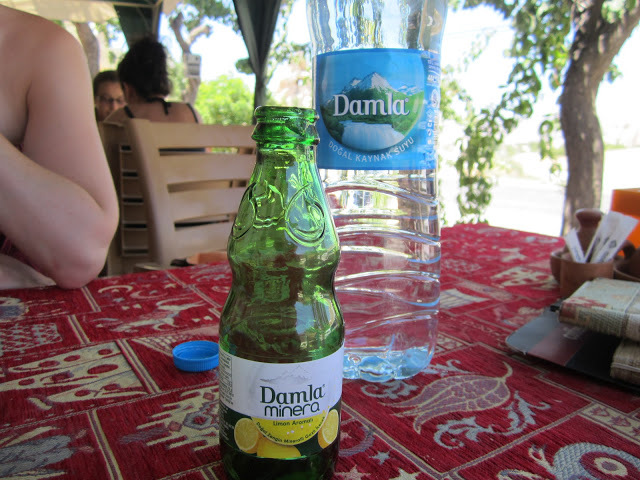 I really liked the lemon sparkling water drink on the left….. 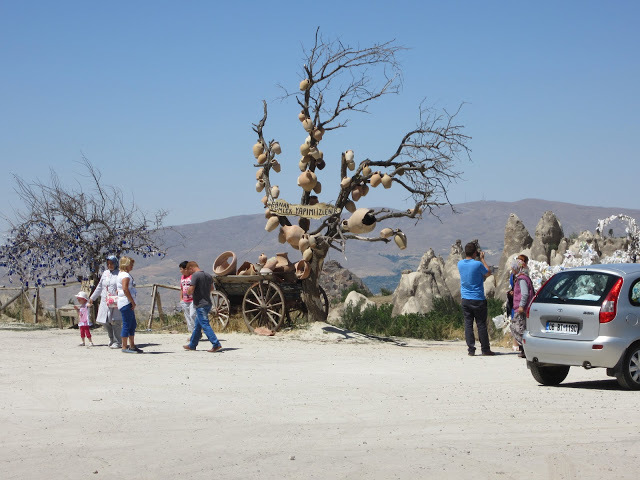 Apparently, in Cappadocia, pottery grows on trees! 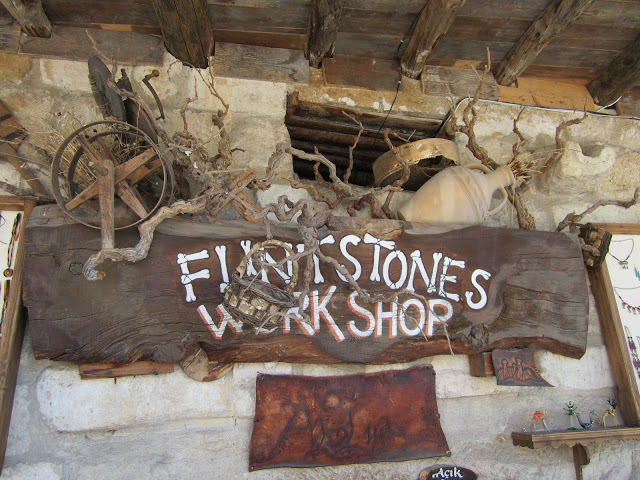 Who knew the Flintstones set up shop in Cappadocia? ← Upcoming Adventures in Eastern Europe!